Two great formulas, spray or wipes! Stoner Trim Shine is a do it all trim restorer that gives you everything you want in one container. It helps eliminate any old wax build up and other contaminants while leaving behind a gorgeous dark finish and UV protection. It makes virtually any plastic, vinyl or rubber surface look like new again. It can be used on faded trim pieces, bumpers, engine bay casings, running boards, rubber moldings, AC vents, dashboards, doors and so much more! Simply spray it on and you are done. Looking for something easier to control? Use the wipes instead! Stoner utilizes a special proprietary technology that allows their aerosol products to dry instantly. So there are no smears, just a beautiful shine and lasting protection. Try the quickest and easiest to use trim care product with the Stoner Trim Shine! Trim Shine Vinyl and Plastic Coating is the fast and easy way to coat vinyl, plastic and other automotive surfaces. Doesn't run, drip or streak. Hides white hazing and wax marks on dark auto trim. Won't harm glass, chrome, metals, or paint finishes. Trim Shine Vinyl and Plastic Coating is so simple and easy to use, just spray and walk away. The fast and easy way to give cars, trucks, vans, SUVs, RVs, motorcycles, and boats a like-new, showroom look. Trim Shine Vinyl and Plastic Coating saves you time and effort. Requires no messy rubbing or wiping. No need to use cloths, wipes, or brushes. Ideal for air dams, and other areas which are difficult or impossible to wipe. Clear, colorless, non-corrosive, non-greasy, and long lasting. Safe to use on most materials, but always test first. For more than 20 years, Stoner has developed and manufactured auto detailing products for professionals. Now, with this easy-to-use aerosol, you too can get the same results demanded by professional detailers. show car collectors, and finicky auto enthusiasts. 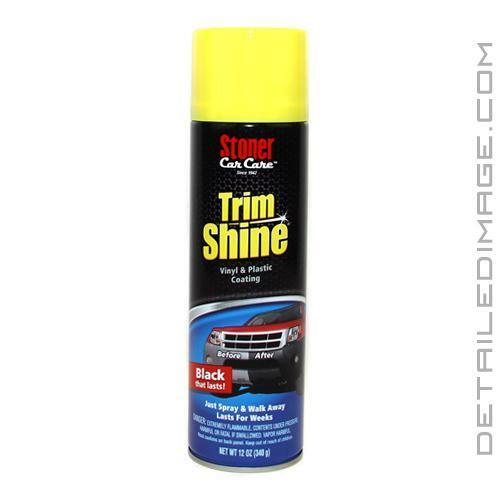 IMPORTANT - Stoner Trim Shine Vinyl and Plastic Coating is slippery and should NOT be used on or near gas, brake, or clutch petals; steering wheels; motorcycle or bicycle seats; or other surfaces adversely affected by a slippery coating. For best results, wash vehicle to remove dust, dirt, and other contaminants. Hold can 8-10 inches from surface to be sprayed. Direct spray head away from your face and apply a thin mist coating. For very smooth or painted surfaces, a light buffing may produce a more desirable shine. HELPFUL HINTS FROM THE PROS: Although Trim Shine and Vinyl and Plastic Coating will not harm or discolor most materials, always test first in a small, out-of-sight area before using. Not recommended for suede and other absorbent surfaces which may discolor. Trim Shine Vinyl and Plastic Coating will spray best when contents are at room temperature. Lower temperatures may reduce spray pressure.